I’ve always felt somewhat sympathetic towards Spider-Man: Turn Off the Dark, the Broadway musical that became the punchline of many a joke from 2009-2011. Still running to this day at the Foxwoods Theatre in New York City, Spider-Man was plagued with an increasingly high budget (rumored to hit $75 million, the most expensive for a Broadway musical), a constantly delayed production schedule, savage beatings from the press (especially columnist Michael Riedel of the New York Post), and various reported physical injuries both in the rehearsal room, and during the months-long preview period of the show. It’s still around to this day, but it’s definitely not a show anyone is going to be defending any time soon. But I personally think it got trashed a little too hard. I saw the show the summer of 2011, after Julie Taymor (the original director) had been removed from the production, and the show had been revamped by “creative consultant” Phillip William McKinley and new co-book writer, Roberto Aguirre-Sacasa. I didn’t think it was that bad, to be honest. Yet, some of the writing was klunky and cheesy, and the songs had messy lyrics, but the stage pictures were screaming “JULIE TAYMOR MAGIC,” and much of the design and special effects work is some of the best work you’ll see in New York right now. It’s not the best show, not by a long shot. But I certainly wouldn’t call it one of the worst shows in history. The sad thing is, you can definitely see the promise of the show in the opening chapters of Song of Spider-Man: The Inside Story of the Most Controversial Musical in Broadway History, written by Glen Berger, co-writer of the musical, and (apart from composers Bono and The Edge) the only member of the original writing team still attached to the show that currently exists on Broadway. 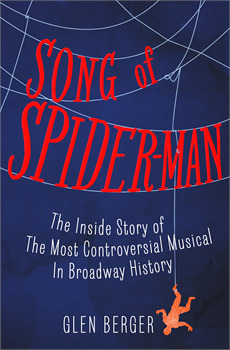 Berger gives us a compelling first-hand account of everything we did, and didn’t, know about the creation of the Spider-Man musical. From the original producer, Tony Adams, dying in The Edge’s apartment right before signing the contract for the show, to the gruesomely slow tech period for the show, where at points, they would get through 21 seconds of the show for every HOUR of tech. Berger gives us all the details, about how he was brought into this crazy world, and the price he had to pay by staying there. It’s a fascinatingly despair tale of the highs and lows of collaboration, and how dreams and ideas once held in esteem can crumble before your very eyes. For theatre lovers, comic-book lovers, or anyone who just wants to read a compelling story, I urge you to read Song of Spider-Man. You won’t look at musicals the same way again. “Do This, Do That” is where we recommend something new and exciting that you should try watching/listening/reading. Mike Daisey is a damn good storyteller. We can argue about the controversy surrounding what is likely his most famous monologue, “The Agony and the Ecstasy of Steve Jobs” til the cows come home (and it’s possible I will write a piece later on describing my thoughts on the matter), but you cannot deter me from believing in the power of Daisey as a storyteller. His extemporaneous performance style and his commanding stage presence truly make him a force to be reckoned with. His work is imbedded with a unique humor and gravitas that makes for a beautifully balanced story and a perfectly balanced performance. He has covered all sorts of topics, and not only experiments with performance topics, but also performance techniques, having once performed a 24-hour monologue, which I’m sure was a sight to behold. 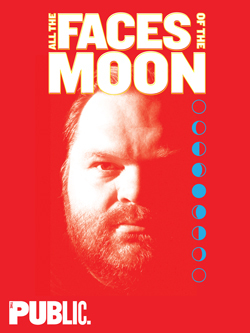 His new epic, entitled “All the Faces of the Moon” is currently taking place at Joe’s Pub in the Public Theater. A 29-night epic, this novel-esque monologue has already covered topics ranging from Mayor Bloomberg, to Dungeons & Dragons, to the Manhattan Theater Club, to farmers markets and packages found in trees and crowns made out of Budweiser cans. If all goes as it should, over the course of these 29 nights, Daisey will weave together a tale of New York, a tale of a country, a tale of people and survival and change. Just as the moon will complete its’ cycle in these 29 nights, so shall Daisey complete a narrative that may go down as one of the most theatrically epic. Daisey is already 4 nights in, and for those who aren’t in New York to witness this event (myself included), you can listen along in podcast form, which you can find on iTunes, or at mikedaisey.blogspot.com. While you may not be getting the pleasure of seeing Daisey in person, it’s still a delight to listen to the podcast night after night, putting together piece by piece what is sure to be a damn good story.